Melinda Elder shared some of her vast knowledge of Lancaster and district’s links with the West Indies, based on research over 30 years. In a richly illustrated talk she focused on two local families who made their fortunes through trade. The Hargreaves family were West Indian merchants, sugar refiners and bankers who built Springfield Hall in Lancaster, where the Lancaster Infirmary now stands. They also purchased farms in Tatham in the late 18th century, notably Oxenforth Green and The Hill, which they remodelled as a minor country seat. The three Wildman brothers who were born at Barkin Gate, Roeburndale were all agents or solicitors for the wealthiest West Indian plantation owner in Europe, the gloriously eccentric William Beckford. Through this they all acquired their own fortunes and grand houses in London, Essex and Kent, where John Wildman remodelled Chilham Castle. They also purchased ships from Brockbank’s shipyard on the Lune, approximately where Sainsbury’s now stands, for Beckford’s West Indian trade, whose names reflected their interests: Chilham Castle, Essex and William Beckford although these vessels rarely sailed from Lancaster itself. Melinda also referred to other families in the area whose wealth came from the Caribbean and we hope she might be tempted back to tell us more at some stage. Edward Huddleston’s fascinating talk featured three diaries, including his own, kept briefly in his teens, and the earlier diaries of farmers living in Roeburndale and Mewith. The illustrations included a fascinating bird’s eye view photo that Edward had taken during a balloon flight over Tatham. He has kindly allowed the image to be used on the Tatham Fells website, so if you’d have liked an opportunity to pore over it click here. Mike Winstanley explained the background to a unique survey of every property which was undertaken just prior to the First World War. Although this was intended to facilitate the introduction of a new Land Tax, the good news is that it these plans were shelved and then dropped at the end of the war. For every property, the survey gave the name and address of the owner, the name of the occupier, the rent, whether any taxes were liable to be paid, the type of tenancy or ownership, descriptions of the number and type of rooms including any bathrooms (very few! ), farm buildings, outbuildings, every field size (all numbered),woodland, hedges and often the surveyor’s personal comments on the nature of the property. If the property had changed hands in the previous 20 years, the price paid was given. Detailed maps of the parish show the boundaries of every property and all the field numbers. 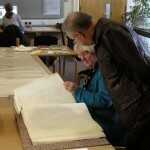 Mike hopes to revise the information and make some of it available on the website. He would be pleased to hear from anyone who might be interested in helping to transcribe some of the detailed material in the survey. 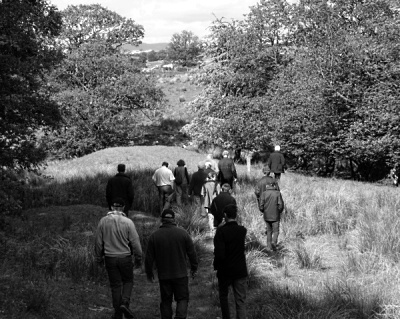 Edward Huddleston led a fascinating exploration of the tiny settlement of Tatham Green and its surroundings, in the company of over 40 members and friends, including a number of current and past Green residents, and some who were born there. But first we were taken far beyond living memory – and a short distance from the Green – to discover the possible origins of the name of the hamlet, and a solution to the vexed question of the boundary between Higher and Lower Tatham. Tatham’s only bus shelter – now sadly bereft of buses – enjoyed its busiest half-hour for years as we tried to picture the moorland that would have surrounded us 400 years ago, and the muddy cart tracks and holloways across it. After returning via the site of Sod Hall to the Green, we learned much about the history of the settlement, and were then treated to Jack and Pam Warbrick’s recollections of the year they spent living in one of the houses in the 1960s, with an outside privy, and a fireplace that billowed smoke; and to the memories of four sisters – Lena, Alice, Dorothy and Mary (née Middleton) – who lived at Green Farm as young children and went to school in Lowgill. Clearbeck House – once a barn in which Edward remembered playing as a boy – was the final stop, for tea and cakes on the terrace overlooking the garden. Many thanks to Peter and Bronwen for providing a wonderful base for the outing. 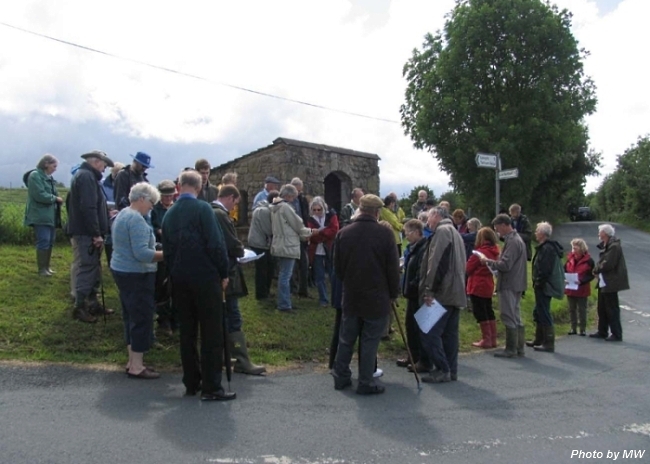 Over 30 members and friends gathered in bright sunshine at Thrushgill, to be led by Bob Taylor to see some of the sites and remains associated with the building of the Haweswater aqueduct between 1948 and 1954 – all of which Bob remembered from having grown up at nearby Botton Head farm. Bob’s memories were augmented by a selection of old photographs. We started through the site of the Hindburn accommodation camp, and past the old canteen, before heading down to the valley floor and viewing the sites of the tunnel access adit, workshops, surface tramways and spoil heaps. 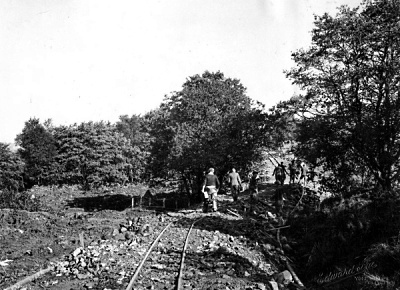 After a refreshment break, the tour concluded with a visit to the pipe bridge over Mill Beck, and the nearby remains of more workshops and tramways. Our thanks to Bob, and to Andrew, Robert, Jenny and the other landowners and tenants without whose co-operation this exploration couldn’t have happened. 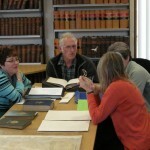 19 members travelled to Preston, where a meeting room had been reserved, in which Assistant County Archivist Jacquie Crosby had set out a large amount of archive material containing information relating to the history of Tatham. Jacquie welcomed us, and told us about the origins and purpose of the LRO, and how we could use the catalogues and search room to examine the archives. 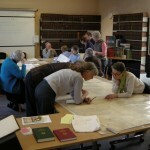 We were then free to spend the morning poring over the books, manuscripts and maps, of which the most impressive was the enormous Tithe Map of 1848. There were also examples of wills and inventories and quarter sessions records, and a number of one-off gems, such as the Lower Tatham school log-book, and the accounts for the building of the Church of the Good Shepherd in the 1880s (total cost £1189). Mike Winstanley, who had organised the visit, was on hand to answer a steady stream of questions about the materials. Many of us resolved to return, and signed up for RO Reader’s Tickets, which give free access, not just to all the materials on the nine miles of LRO shelving, but to many other ROs throughout the country.